That’s “LOAN” as in “We have to repay our Chinese Massas”. 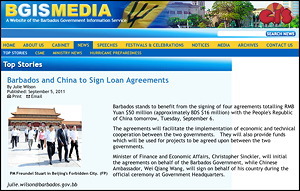 But the Barbados Advocate says “Closer Ties“ and doesn’t use the word “loan” or indicate in the paper’s entire 300+ word article whether the $15 million has to be repaid. Then check out $15.7 China deal in the Nation News. Did Barbados sign for a loan? You tell me! The Nation News says that we signed “banking agreements and accounting procedures for the financing”. The words “loan” or “gift” are absent from the article. Hey… I’m just saying that Bajans deserve better than that from their news media. Doan ya think? Kenton X. Chance is a Vincentian journalist living and studying in Taiwan for the last five years. He also runs the excellent I Witness News blog and today he had the unpleasant duty of reporting on his own WikiLeaked conversations with US Consulate personnel. 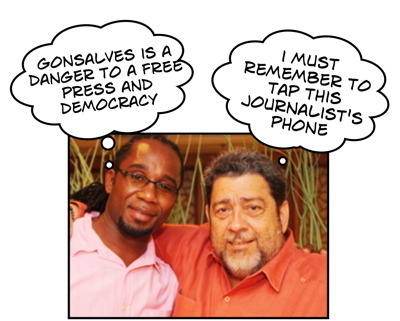 Chance and other journalists in the WikiLeak were concerned about PM Gonsalves using his power to curtail freedom of the press. They spoke confidentially to the US diplomats and now it’s all over the place. At least Chance has the courage to publish his own words from the WikiLeaks cables. Unlike some folks who are trying to convince everyone that they said not one word of what was reported in many cables for many years, Kenton Chance is not going that route: he’s standing behind what he said. KINGSTOWN, St. Vincent – While Glenn Jackson, murdered press secretary to Prime Minister Dr. Ralph Gonsalves, was the main contact here for U.S. officials in Barbados, according to WikiLeaks, several other Vincentian media professionals were also contacts for American diplomats in Bridgetown. A classified U.S. diplomatic cable dubbed “St. Vincent: A Democracy Under Stress” lists two journalists among “an increasing number of Vincentians” who in 2006 warned that “the PM’s fondness for the leaders of Cuba and Venezuela is indicative of his autocratic nature”. …The cable also relate a conversation that Shelly Clarke, editor of The News newspaper allegedly had with U.S. diplomats.The document cited Clarke as saying that the United States should have funded the opposition New Democratic Party in the December 2005 elections.